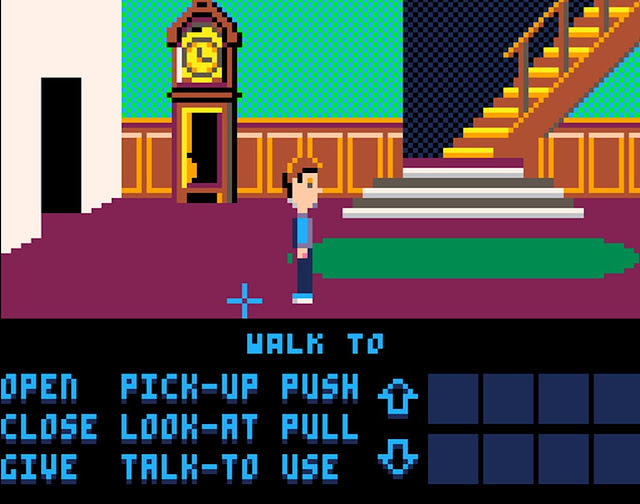 Indie Retro News: SCUMM-8 - Adventure classic Maniac Mansion demake on the Pico-8? It's possible! SCUMM-8 - Adventure classic Maniac Mansion demake on the Pico-8? It's possible! Throughout the years we have always been impressed by what can be achieved with the Pico-8; a complete 2D game creation environment [code, sprite, map, SFX and music editors] for making games with very tight restrictions and more especially on the PocketCHIP miniature computer, which ships preloaded with the Pico-8 software. But now we are going to show you something special, an Easter treat if you will, as a "demake" of the SCUMM engine that powered most of the classic LucasArts adventure games, such as Monkey Island and Maniac Mansion has been released as ' SCUMM-8', on the Pico-8! Yes you read that right, SCUMM-8 (demake) has been released on the Pico-8 and is heavily inspired by the SCUMMVM engine, an engine which originally allowed you to run certain classic graphical point-and-click adventure games on a modern pc, provided you already have their data files, such as Monkey Island 1-3, Day of the Tentacle, Sam & Max and many others. However there is a difference, as even though this is a demake and is inspired by rather than a true 1:1, this Pico-8 software will soon enough make it possible for anyone to make their own point & click adventure games in PICO-8 as if it was a classic LucasArt adventure, just not be able to run the originals. Currently the demake is still a work in progress, although it is mighty impressive to see what has been achieved so far. You can visit multiple rooms, there's pathfinding for walking, dialogs between actors, cut-scenes, a camera system, room transitions, background and level scrips, a screen shake effect AND the ability to use commands such as open, close, push and pull. If anything this is the next best thing for adventurers and more so for those of you who use Pico-8! Don't forget if you like our news, as I put my heart and soul into bringing it to you all, is to hit the donate button, every little helps!